Start a GoToAssist Seeit session from anywhere on your iPhone or iPad. You’re away from the office. You’re in the field. You’re back at home. Wherever you happen to be, you can still provide support. 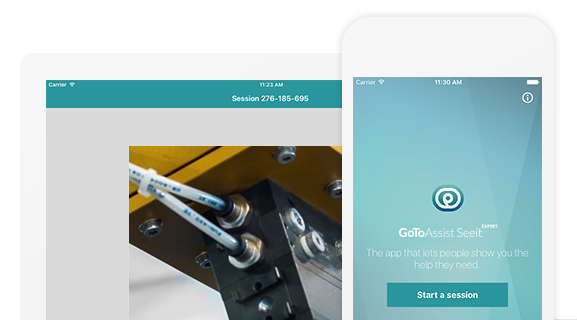 The GoToAssist Seeit Expert App for iOS devices lets you instantly see what your customers see – so you can solve their problems fast. The expert mobile app offers the same built-for-business features of the desktop version. Camera streaming, built-in audio, snapshots, recording – it’s all there. You have all the tools you need to see, document and solve any problem. Not every issue can wait till you’re back at your desktop. Customers who need help urgently can get help quickly when you use the expert app. Just generate a code and send it along like normal to connect immediately. Then save the day. Customers confused about where to look? You can easily place an arrow on your customer’s screen by just tapping the same spot on yours. These annotations work both when you’ve paused the video and when you’ve opened a snapshot. Learn more about GoToAssist Seeit features. Invite your customers to join you with the GoToAssist Seeit app for iOS or Android. Place arrows on the paused video or on snapshots to help explain the solution. Find the perfect suite of tools for your business or industry. Have questions? Give us a ring or chat with our sales team.